In the Pacific Northwest, with our long summer days and mild temperatures, having an outdoor area in which to read or entertain is a gift. One way to greatly expand your options for living space is to add a deck to your home. Once the decision has been made to add a deck the next decision to consider is decking material. The first option is natural wood. It makes for a beautiful natural-looking deck. In the PNW we can use our native cedar. It is warm to the touch, and natural oils in the wood resist warping and cracking under weather damage. 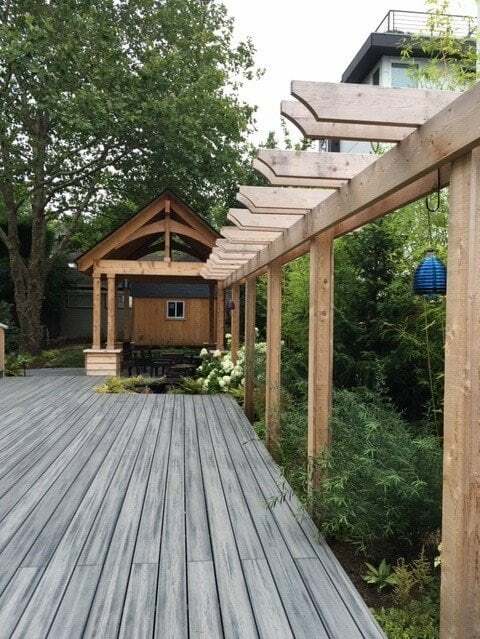 The natural look of cedar complements the landscape and if left untreated will fade to a soft silver-grey. The lifespan of this type of deck is easily 20 years. Alternatively, sustainably grown tropical hardwoods can be used. They are more expensive than cedar, but some are so dense they sink, therefore they can last forever. However, natural wood decks need routine maintenance. A yearly cleaning with deck cleaner to keep dirt and mildew at bay will extend the life of your wood and enhance the natural wood tone. 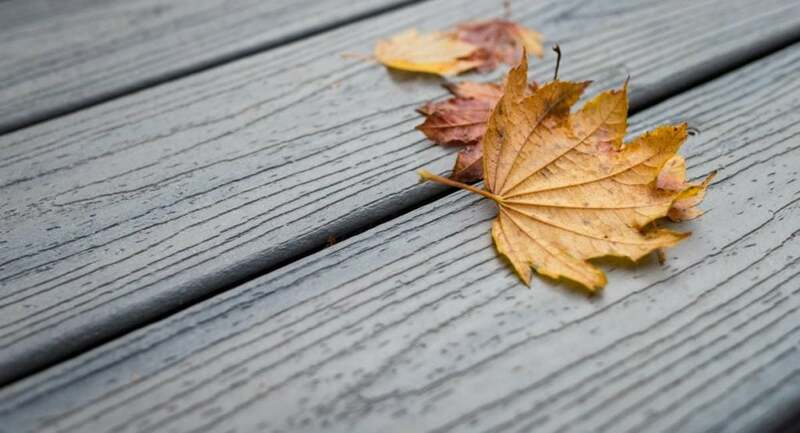 Keep debris such as leaves and pine needles from piling up and allow your deck to dry out completely by moving planters, pots, benches and tables around routinely. This will extend the life of your deck longer than one that stays damp. 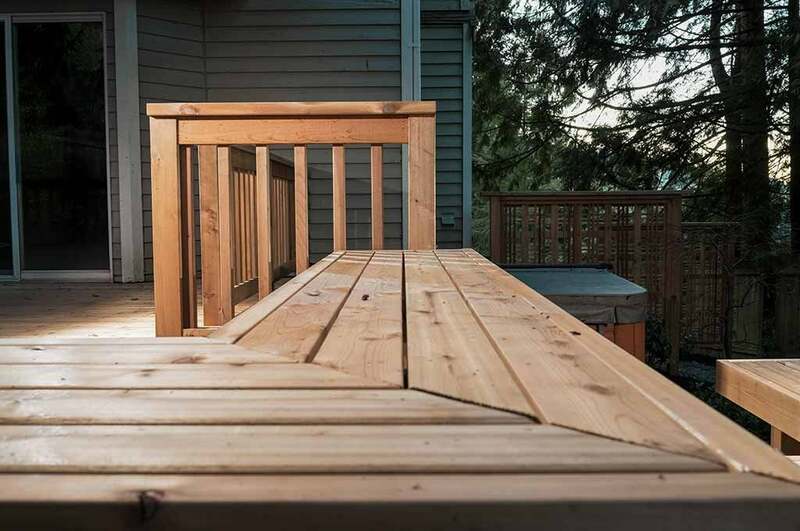 Along with an annual cleaning, the deck will need to be painted or stained to withstand all our rain and occasional snow to prevent the wood oxidizing and losing its rich luster. An alternative to wood decking is a composite material made of different types of plastic, often with a hard PVC surface. Most contain some degree of recycled plastic and wood fibers (sawdust). This is a great option if you are looking to use recycled and eco-friendly products. These are extremely low-maintenance materials. There is no sanding or staining required and they are easily cleaned with water and soap. There are very few downsides to a composite deck, and some manufacturers even have a 20-year warranty if not a life-time guarantee. However, some products look more plastic-y and feel cold to the touch. They also get very hot in the sun. The color options have improved over the years but if you decide to paint your house, better match it to your deck. The other downside is a composite deck costs significantly more than the price of a cedar wood. The pros and cons of decking material are really between how much work you want to do and how much you wish to spend up front. Keep in mind adding a deck adds great value to your property and to your own enjoyment of your home. With a Pacifica free consultation, we can review options for your home and help you decide what design direction will maximize your enjoyment of your home with your family and friends.